Glaro Inc. announces unique recycling solutions in effort to help its dealers solve the problems of building owners and facilities managers across the United States. Over the years, we have developed a versatile product line so that a Glaro dealer can virtually design his or her own recycling stations. We have selection and depth in every line. For years, leading American recycling container manufacturer, Glaro Inc., has helped support its dealers who work with building managers to improve their facility’s recycling programs. Responding to market demand for quality metal recycling receptacles, Glaro has introduced new architecturally pleasing recycling bins and stations. 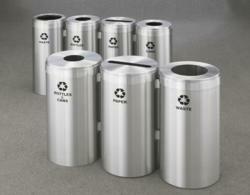 The company’s recycling receptacle collections range from single purpose recycling cans to modular recycling stations. “Over the years, we have developed a versatile product line so that a Glaro dealer can virtually design his or her own recycling stations. We have selection and depth in every line to help solve recycling challenges in any building,” commented Robert Betensky, Executive Vice President. As Glaro has serviced customers, the receptacles manufacturer has observed industry trends. Even with the acceptance of Go Green recycling programs around the USA, recycling collectors and janitorial maintenance staff are finding that a lot of recyclables are still being placed into waste receptacles. In some cases, they have found that buildings are not providing enough recycling receptacles placed in strategic locations. In other cases, the signage used near recycling containers is suboptimal or the importance of recycling is not communicated properly in a building. In other cases, Glaro has found that properties are not providing separate recycling receptacles as required by local standards. “In these cases, we find that there are two issues. There may be bottles and cans being tossed into one single receptacle adding to work downstream whereas the cans should be in separate recycling receptacles at the point of collection. Glaro, Inc. (http://www.glaro.com) is a leading USA manufacturer of commercial and consumer aluminum products sold through dealers for close to 70 years. All products ship in 1 to 3 days. Glaro products are the result of a focus on thoughtful innovation and design. Product lines include bellman carts, steel and aluminum trash receptacles, recycling receptacles, smokers’ posts and receptacles, crowd control posts and systems, sign frames, and directories, coat hanging equipment, umbrella stands, planters, and key drop boxes. A diverse selection of models in 31 finishes is produced in the Hauppauge, New York plant by skilled Glaro craftsmen. The company is known for its quality merchandise and its ability to consistently quick ship all products. The customer service department provides unusually prompt personal service and is sensitive to the needs of dealers.